Thank you to all who entered the Farmhouse Soaps giveaway! I would give you each a free bar of soap if I could, but since that would cost me around $700 I decided – no. However, you’re more than welcome to order your own! The Chai Tea and Fig and Brown Sugar sound good to me! And Hannah Weaver, who as our runner-up won two bars of choice. O! How would I choose?!! They all sound amazing. But coffee would have to be one of my first choices. Pumpkin souffle, cranberry orange and grapefruit tempt me also. Around home I’ve been using Farmhouse Soap myself, and it’s been wonderful. It doesn’t have the gummy residue or dark under-scents of some homemade soaps – it’s pure and clean and smooth. And mmmm-hm those lovely scents! Each bar sells for $5, with the exception of the Charcoal Facial Bar, which is $5.50. Shipping is charged at cost. Any of these would be a fine spot to place an order. Wendy is also starting an e-mailing list update for people who prefer that to social media, so email her if you’d like to sign up for that. 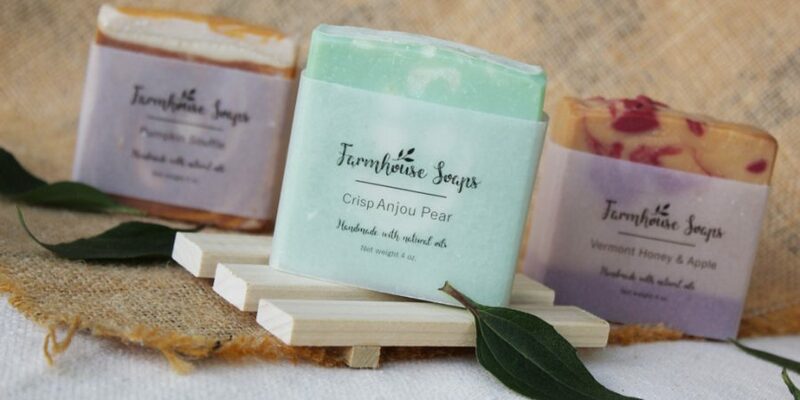 Farmhouse Soaps are sold locally at two retail locations, Massanutten Produce LLC in Penn Laird, Virginia and Clugston’s Market & Cafe in McConnellsburg, Pennsylvania. That will save you shipping, and you can sniff them all. One more fun tidbit – In case you’re curious, like me, here’s a ranking of the current Farmhouse Soap scents, based on how many “votes” each got from you! Thanks again for joining the fun – Cheers! Congratulations to the winners! Thanks Shari for doing this and thanks to all of you for your response and compliments. I am just blown away! I’m happy you two were the winners, Elizabeth and Hannah!!! . . . Thank you, Wendy . . . And thank you, Shari! How delightful! Thank you very much, Shari and Wendy! This soap sounds so fun. Congratulations ladies! Enjoy your soaps!